Sit atop a bench, perpendicular to it (i.e. transversely--so that your legs can hang off it), and hold onto the side of the bench next to each of your thighs. Lean backward until your body is at around a 45-degree angle with horizontal (your legs will have to be extended for balance to be maintained). In a continuous and concerted motion, bring your torso (upper body) toward your pelvis in a crunching movement (by rounding your back) and raise your knees toward your chest, while exhaling throughout. Again, in a continuous and concerted motion, lower your torso backward (until it is at roughly a 45 degree angle) and lower your knees (until your legs are nearly straightened), while exhaling throughout. You have now returned to the starting position. Seated leg tucks are a nice way to work the gamut of the abdominal muscles in a single exercise. 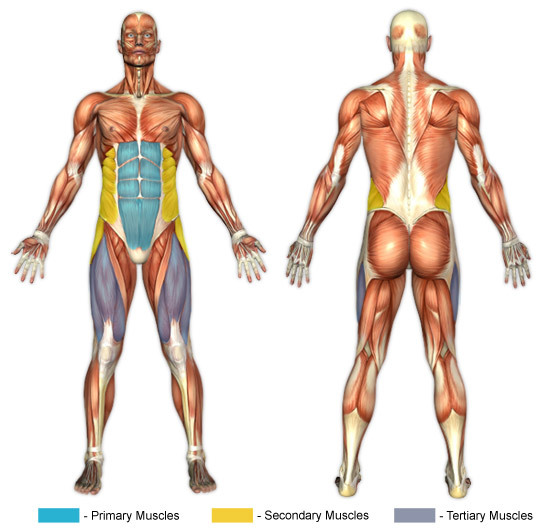 When your knees are at your chest the abdominals (rectus abdominis) are primarily being worked, and when your legs are extended the hips (iliopsoas) are additionally engaged. This exercise should be performed with grace and control. The goal of the exercise is not to complete a high quantity of repetitions but rather complete high quality repetitions with emphasis on the abdominal contractions.